The Rendlesham Forest Incident is Britain’s most important UFO case. It has been called the British Roswell; some even believe it is the most important UFO case ever. The “Incident” was actually a series of incidents spread over a number of days around Christmas time in 1980. 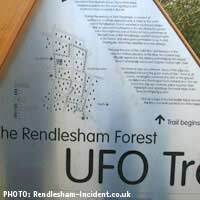 The events occurred in Rendlesham Forest, a large pine forest near Ipswich which was situated between two U.S. military bases known as RAF Bentwaters and RAF Woodbridge. It was in the middle of the night, just after Christmas, when guards at the Woodbridge base first noticed a strange light glimmering through the trees. A few men were sent to check it out. The lights came in a number of colours: red, blue and yellow; some were steady and some pulsated, and their source appeared to be moving. The soldiers pursued the object for a time through the woods until it came to rest on the forest floor. It was triangular, about three metres tall, and three metres broad at the base. A few days later a reception was being held at the base. Amid the celebrations, a guard appeared and notified his commander that “it” had returned. A small party, led by Deputy Base Commander Lt. Colonel Charles Halt, was sent to investigate. Halt took a dictaphone with him and recorded his impressions into it as the events unfolded. The transcript of Halt’s tape and an official memo he wrote some days later can be found easily on the web today. The search party noted that something had sent the local farm animals into a state of frenzy. At one point, the object appeared to send down beams of light to touch the earth, one of which landed close to Lieutenant Colonel Halt. Eventually, the men caught up with what they were chasing. Whatever it was appeared to have landed in the forest. They described it as being around the size of a small car, triangular in shape, glowing with an ethereal light, red at the top and “with a bank of blue lights underneath.” After a time, it took off and sped away, though mysterious lights, belonging to it and possibly other objects, continued to be spotted for hours afterwards. In the cold light of day, some of the soldiers returned to the scene of the encounter. They saw what they believed to be scorch marks on the nearby trees; and three indentations were found in the soil where the craft was believed to have landed. Radiation measurements were taken, and the indentations were found to have levels of radioactivity approximately ten times greater than would normally have been expected. Halt submitted an official memorandum, describing what he had seen. It is not known precisely what reaction there was, if any, within the US military. It is known that General Gabriel, Commander-in-Chief of all US air forces in Europe, made a visit to the base shortly after the incident occurred. Some believe he took possession of all documents and materials related to the case. A few of the eye-witnesses have complained that they were warned to shut up about what had happened, and subjected to surveillance and harassment over the years. On his retirement from the military, Lieutenant Charles Halt, however, went public with his account, and became active in the field of UFO research. What makes the Rendlesham incident special? First, there is the closeness of the contact. Many UFO encounters are nothing more than the sighting of strange lights in the sky. In this case, observers were able to approach within a few feet of the object, touch it, and describe it. Second, there is the persistence of the activity, over hours and even days. Third, there is the number and status of the eye witnesses – these were high-level military professionals, trained observers, who had no reason to make up stories. Indeed, if anything, their career prospects were more likely to be impaired than improved by a claim that they had seen an alien spacecraft. Fourth, there is a substantial record of official documentation, and even a real-time audio recording of a “UFO chase” as it occurred. The tangible evidence at the scene is also significant. Despite the wealth of evidence and the eye-witness testimony, there are still Rendlesham sceptics out there, even among the ranks of UFO believers. They argue that the strange lights could easily have been those of a nearby lighthouse, a falling meteor, or even debris from a Soviet satellite burning up in the Earth’s atmosphere. The rest they attribute to an overactive imagination on the part of the eye-witnesses. What were described as scorch burns on the trees they insist were nothing more than marks left by the forest workers, and the indentations in the ground, they believe, could well have been made by animals. There is no doubt that the Rendlesham Forest incident is one of the most intriguing UFO cases ever. And, unlike Roswell, it is not locked in the distant past, meaning that no further substantial investigation can take place. The eye-witnesses are still alive and breathing; many official records pertaining to the incident, from both the British and US governments, have come to public light through freedom of information requests, and can now be found on the internet; and the Forestry Commission, which owns Rendlesham Forest, has even helpfully established a UFO trail so that walkers can visit the scene where the incident occurred. So, if you have an interest in the case, the resources are certainly out there for you to follow it up!